Welcome to another installment of LiveAnalysis! Today’s blockbuster semifinal features two of the top three women in the WTA: World No. 2 and defending champion Maria Sharapova and World No. 3 Victoria Azarenka. Both women have dropped a single set of tennis on their way to today’s semifinal: Maria Sharapova got bageled by Jelena Jankovic yesterday, while Victoria Azarenka was pushed to three sets by none other than Alizé Cornet in the third round (yep, you read that correctly). The Belorussian is making her maiden appearance in the last four at Rolly G, while this is Maria Sharapova’s fourth semifinal appearance. 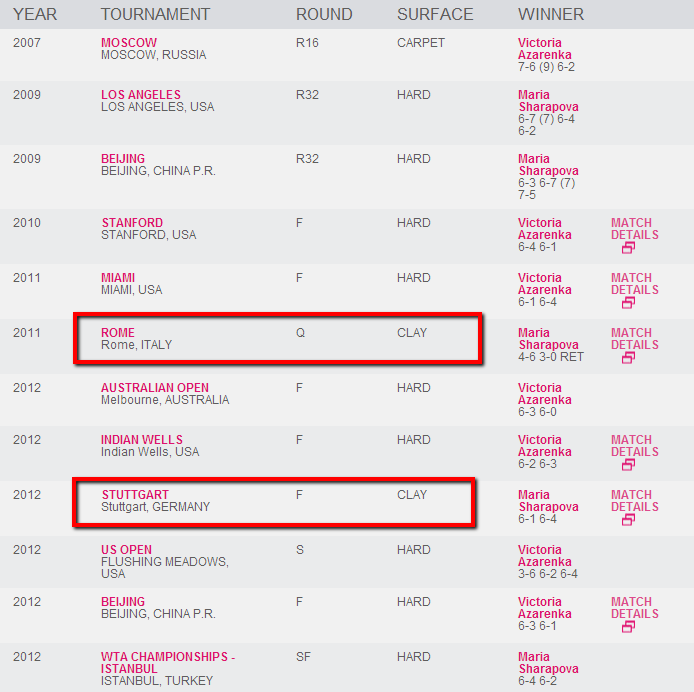 As you can see from the highlights above, Maria Sharapova has won both matches they’ve played on clay. The most recent one, the 2012 Stuttgart final was quite revealing, as Azarenka (who had won the previous two encounters with Sharapova rather easily) offered very little resistance to #ClayPova. This is the third time these women meet in a Grand Slam, and the first time they meet at the French Open. Victoria Azarenka has won both previous Slam matches. Of these 12 encounters, the winner of the first set went on to win the contest 9 times. Sharapova has come back from being a set down twice (one via retirement), while Azarenka only did it at last year’s US Open. 1. Who will be able to steer the majority of baseline rallies? For Maria Sharapova, it’s always key to be in control of the proceedings. However, her clay success has come in large part from her ability to get back into points where she’s being forced to defend. Her improved movement on the red stuff has offered her these extra opportunities, and flummoxed opponents who marvel at how she can get to balls that the old Maria Sharapova wouldn’t even dream of getting. Still, Maria Sharapova has gotten into trouble in the past against Azarenka when she’s been yanked around the court by Azarenka’s ability to change the direction of the ball with almost every shot. Even on clay, I don’t see Sharapova advancing to the final if she’s to concede the steering wheel of rallies to Azarenka. 2. Who will get an edge with their return of serve? Both women excel not only at putting serves back in play, but also at punishing second serves. Hence, it’ll be fascinating to see who gets an edge in this department, and who finds ways to protect their second serve more effectively. 3. Can Azarenka find ways to break down Maria Sharapova’s forehand? Victoria will try to make Maria run, but she’ll also try to put a dent in the Russian’s confidence by attacking that weaker wing of hers. One thing Azarenka will surely try and do is have Sharapova hit most of her forehands on the run, amping up the pressure on that single-hander to perform. First Set – Maria Sharapova will serve first. 0-0: We start off the proceedings with a wonderful point, which Azarenka takes after using a drop shot effectively, and then stretching for a volley. A wonderful omen. But that’s followed by Sharapova’s first DF of the match. 0-30. 2nd serve again. Azarenka makes Maria hit on the run, and a BH error follows. 0-40, and triple BP for Victoria. 2nd serve…again. And Maria’s 2nd DF of the match means Azarenka has broken to start the match! That was a weird game – it started with a wonderful point, and it was followed by Sharapova errors. I’m listening to the ESPN Deportes broadcast, and Javier Frana said ominously that Sharapova started her match against Jankovic in this same way, and ended up getting bageled. 1-0, Azarenka: Sharapova shuts off the UFE faucet, and is up 0-30 in a flash. Sharapova blasts a 2nd serve return, and keeps the foot on the gas pedal: 0-40 after another Azarenka forced error. Triple BP for Maria. 2nd serve. A fascinating point ensues, where Azarenka gets the first chance to change the direction of the ball with a DTL BH and a DTL FH, and ends up forcing Sharapova’s error. Another BP is saved after a Sharapova shot clips the net, giving Victoria plenty of time to punish the short ball. 30-40. A nice 1st serve leaves a short return for Azarenka to put away. Deuce #1. After all that hard work, Azarenka sets up BP #4 for Sharapova with a BH UFE. Then, Maria drives a BH deep up the middle, and forces the error off Azarenka’s FH. Maria Sharapova gets the break back! 1-1: Sharapova gets a 30-0 edge after some violent hitting, but Azarenka strikes back to pull level at 30-all. 2nd serve for this key point. Azarenka drives a good return back, but Maria Sharapova gets a wonderful CC BH to tilt the point in her favor, and set up a simple FH putaway. GP for Sharapova, 40-30. More impressive depth from Sharapova’s BH, and she holds. What I find fascinating in this match is how explicit both women are with their tactics. This is what happens after 12 meetings: they each know exactly what they need to do in order to be successful (Sharapova – avoid being pushed around, Azarenka, ditto), and they’re trying to go about it in their own unique way (Sharapova by looking for pace and depth to push Azarenka away from the baseline, while Azarenka is trying to get Sharapova on the run). 2-1, Sharapova: More depth means more forced errors by Azarenka. She’s down 0-30, and now 0-40 after a great 2nd serve return winner by Sharapova. Another 0-40 opportunity for Maria. 2nd serve. Azarenka gets a great 2nd serve in, gets a look at a relatively simple BH DTL putaway, but her shot clips the net and lands wide. Unfortunate for Azarenka, but Maria Sharapova is now up a break! This really is a battle between depth of shots and changing shot direction. Depth is winning, after a dodgy start. 3-1, Sharapova: Maria is up 30-0, but then leaves a ball short, Azarenka pounces, and it’s 30-15. However, Sharapova corrects the mistake soon after, and she holds to 15. 4-1, Sharapova: Sharapova starts proceedings with a gorgeous lob winner, and later hits a wonderful BH pass on the run to go up 0-40…yet again. 2nd serve. And another great 2nd serve return forces the error, and Maria Sharapova breaks again, and will serve for the first set. Maria is playing at an incredibly high level – her depth of shots is destroying Azarenka at the moment. A wonderful reaction to such a terrible start from Maria. 5-1, Sharapova: A DF makes it 15-all. 3rd of the match. A great SW makes it 30-15. A swinging volley success gives Maria 2 SPs. And an Ace gives her the set. Simply irresistible stuff from the reigning champ after an atrocious start. First Set to Maria Sharapova, 6-1. 0-0: Azarenka has a 40-15 edge, and threatens to hold for the first time in this match. Also, she’s won the same amount of points on serve as she did IN THE ENTIRE FIRST SET. And Azarenka holds after a nice 1st serve gives her a simple swinging volley opportunity. 1-0, Azarenka: Maria goes down a notch, and buries a simple FH to bring us to 30-all. She then puts away a short return with her fantastic BH, and it’s 40-30. GP will be played on a 2nd serve. And what a second serve…a missile up the T.
Maria obviously cooled down a bit from her sizzling form of the first set, but that was to be expected. This is Azarenka’s opportunity to get back into this match. Because if Sharapova starts flying again, this semi won’t last very long. 1-1: A few errors from Sharapova, and Azarenka has a chance to hold again. 40-15. But then the 2012 Rolly G champ murders a return with a FH CC screamer. Then another great return sets up a tricky putaway FH, which Maria doesn’t miss. Deuce #1. A first serve gives Azarenka the chance to be aggressive, and she doesn’t waste the opportunity. AD-Azarenka. But a hard BH return up the middle by Sharapova triggers the Belorussian’s error. Deuce #2, which becomes AD-Azarenka when Victoria drives a hard CC BH to force Sharapova’s error. A clutch Ace up the T grants her the hold. 2-1, Azarenka: In absolutely no time, Maria Sharapova is up 40-0 behind a fantastic ace out wide. An Azarenka FH UFE completes Sharapova’s love hold. So far, the 2nd set has looked nothing like the first. Kudos to Azarenka for stopping the bleeding. However, it does feel like if Sharapova brings some of that 1st set magic, this set will stop being competitive in a hurry.But with every Sharapova error, that possibility seems far from certain. This set will be a grind. 2-2: Azarenka is trying to respond in kind to Sharapova’s love hold, and has 3 GPs at 40-0. A good wide serve seals her first love hold of the match. 3-2, Azarenka: Maria Sharapova finds herself in a 15-30 bind, but her CC BH comes to the rescue. 30-all. Then…a moonball exchange takes place. It was triggered by a smart Sharapova loopy ball after a glorious return by Azarenka. Victoria then blasted an I-O FH winner to set up her first BP since the opening game of the match. And a great return up the middle forces Maria’s error, and Victoria is up a break! Very little depth from Sharapova, and she’s paying for it. Azarenka has stayed within herself, waiting for an opportunity like the one before, and it’s paid off. 4-2, Azarenka: Sharapova wants to right the ship immediately, and goes up 0-30 in a hurry. 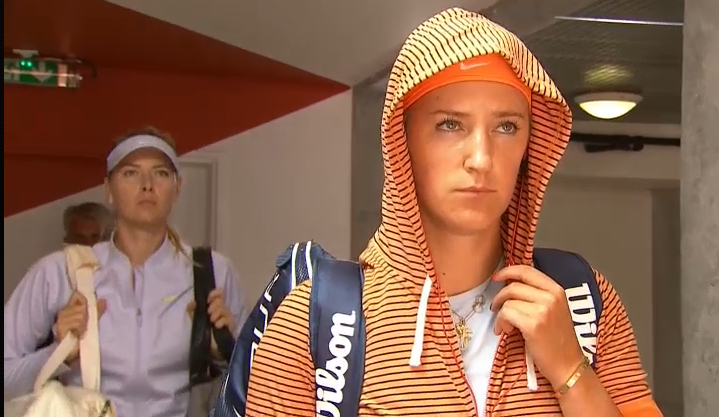 However, Azarenka plays a sweet dropper that Maria can’t get to. The pair trade haymakers for a bit, and then Sharapova’s BH cracks – she won’t be happy about that. GP for Azarenka. And the World No. 3 consolidates the break with a SW.
A dramatic turn of events, no? In unrelated news, Brad Gilbert, who’s sitting courtside, reports that some rain is starting to come down (“pretty thick drops,” he says). Maria wants to stop (naturally), but Maria Alves tells her to carry on. Which she does. Sharapova then saves a BP/SP with a SW, but then DFs away the set. A strange ending to the set, but full marks go to Azarenka for weathering the storm and putting that 1st set beatdown in the rearview mirror. 0-0: And we’re back on! Azarenka starts the third set in the same way she started the match: with a well-timed dropper. Later, a swinging volley makes it 30-all, and a bad 2nd serve return by Sharapova gives Azarenka a GP. An error by Azarenka makes it Deuce #1, and a glorious FH DTL by Sharapova gives her the first BP she’s had since the end of the 1st set. The pair exchange blows with their best shots: the CC BH, and when Sharapova gets a look at a BH DTL, she goes for it. Sadly for her, she pulls it wide. Deuce #2. SW, so AD-Azarenka. Rinse, and repeat: a clutch SW up the T gives Azarenka the key hold. Azarenka squandered a golden chance to hold much easier with that miss at 40-30, but holds. Surprising backhand miss from MS on break point. Noteworthy that two of the 3 females with the most DFs at this year’s FO are these two, who also happen to be two of the three best players in the world. 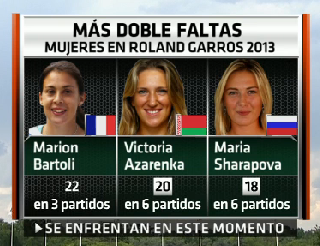 Also, Marion Bartoli hit 22 DFs in just 3 matches. Oy. 1-0, Azarenka: The two women trade UFEs, so we’re at 15-all. A Sharapova FH miscue makes it 15-30. A great I-O FH by Sharapova makes it 30-all. Now Maria uses a wide serve and a fantastic CC BH to give herself a chance to hold. Then Sharapova plays some good defense with her BH, and ends up forcing Azarenka’s error. A huge hold for Maria. 1-1: A wild FH error by Azarenka makes it 0-30. Amber alert for her. However, Victoria rights the ship via a well-timed BH DTL. Maria then gets a great I-I FH return in, goes on the offensive, but ends up missing a FH badly. 30-all. It’s getting nervy in here. Sharapova drives a hard return up the middle, and forces Azarenka’s error. Another BP for Sharapova in this set. And then Maria produces some dazzling tennis, punctuated by a gloriously angled CC FH, and she goes up a break! That was superb tennis from Maria Sharapova on break point. Full on aggression, lots of depth, and a glorious shot to finally tip the balance of the point in her favor. 2-1, Sharapova: Maria DFs to make it 15-30, but she then hammers Azarenka’s AD court with her I-O FH and her CC BH. Now a fantastic DTL return by Azarenka forces Sharapova’s error, and Victoria has a chance to get the break back. But what a time for Maria Sharapova to come up with her 1st Ace of the set, and 6th of the match. Deuce #1. And Sharapova follows that up with another Ace. However, that’s followed by yet another DF. Deuce #2. Azarenka plays fantastic defense, withstands the Sharapova missiles, and the Russian’s favorite shot lets her down, as a CC BH sails well long and wide. BP for Azarenka again. 2nd serve. Which barely catches the tape, and Maria puts away the resulting short return…coming inches away from touching the net. Deuce #3. Then, a costly FH UFE gives Sharapova a GP. A furious rally ensues…but Maria sends a FH DTL well long. Deuce #4. Azarenka hits a wonderful CC FH, forces Maria’s error, and she has yet another BP. 2nd serve…and a DF to hand over a break. Sharapova has never made it back to the final of the tournament the year after winning that Slam. Feeling the nerves. 2-2: Another wild Azarenka FH UFE makes it 15-30. SW, 30-all. Another Azarenka CC FH UFE, and Sharapova has a chance to recover her break advantage. Maria Sharapova hits an excellent I-I FH return, then blasts away, barely catching the tape on most of her shots. 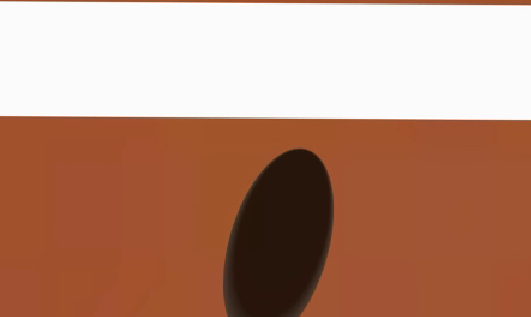 The last one was the closest: Azarenka thought the I-O FH putaway was out. It wasn’t, and Sharapova has broken again! 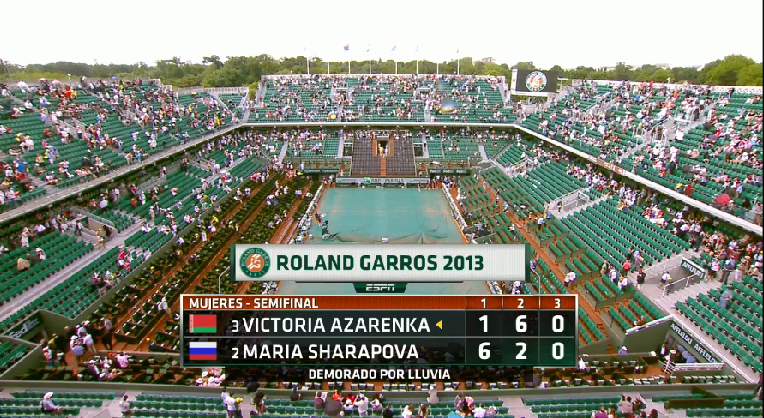 It’s Azarenka’s FH that’s breaking down, and not Sharapova’s. That’s not a development that will please Victoria. Maria doing a great job of sending deep shots towards that wing. 3-2, Sharapova: A DF by Maria makes it 30-all. She seems exasperated. A nice rally follows, and it’s Azarenka’s trusty BH that sends the ball long, unprompted. GP for Sharapova, but it goes begging after she is pushed back behind the baseline by a great Azarenka return. Deuce #1. A fun point from a tactical point of view follows: Sharapova goes hard with her CC BH into Azarenka’s AD corner, Azarenka reacts positively and hits a BH DTL, but Sharapova anticipates it and crushes a FH CC. Azarenka cannot send the reply on the court. AD-Sharapova, and she holds after a clutch Ace up the T.
4-2, Azarenka: Another Azarenka FH UFE, and it’s 0-15. An Ace makes it 15-all, though. A glorious Sharapova BH DTL makes it 15-30. Then, a fantastic CC BH return by Sharapova forces Azarenka’s error. 15-40, in what feels like double MP instead of double BP. And Maria converts it, after a deep, hard return. She’ll serve for a spot in the final! 5-2, Sharapova: A Penny Hardaway CC FH by Victoria Azarenka makes it 0-15. 2nd serve. Sharapova goes for an I-O BH that seems ill-advised…and she misses. 0-30. Ace up the T, 15-30. 10th of the match to go with 9 DFs. 2nd serve. Then…a spectacular Sharapova running BH DTL after a fantastic CC BH return by Azarenka. Full marks – that was a crazy shot. 30-all. Azarenka sends a decent CC FH return, but Sharapova is on it, and blasts a FH DTL winner. MP #1 for Maria. She almost hits an Ace…but misses the tape by very little. Azarenka drives a BH CC return, Sharapova goes for another running BH DTL…but nets it. Deuce #1. More great defense from Sharapova on her BH side: she somehow gets to a very good Azarenka shot, sends it deep, and forces the error. MP #2 for Maria. Good 1st serve…better return. Forces the error, and it’s Deuce #2. A fantastic slider out wide results in an Ace, and it’s MP #3. Sharapova sends a 2nd serve to Azarenka’s BH…and another hard return forces her error. Deuce #3, and it’ll be BP for Azarenka after a FH UFE by Sharapova. However, it’s Deuce #4 after a clutch Ace up the T. A good Azarenka FH from the middle of the court forces Maria’s error, and the Belorussian will have another BP. Maria goes up the T again, Azarenka guesses right…but can’t get the return over the net. Deuce #5. MP #4 for Sharapova after a good FH DTL winner after a short return. Azarenka drives a good return, Sharapova slips, almost falls, and ends up losing the point. Deuce #6, which becomes BP again, as Sharapova tosses in her 10th (!!!) DF of the match. 2nd serve. And DF #11 seals the break for Azarenka. 5-3, Sharapova: It’s 40-0 in a flash. Sharapova looks like she’s got 40 lb ankle weights on now. A FH UFE seals the love hold for Victoria Azarenka, who looks to have all the momentum at the moment. Four UEs in a row from Sharapova there. What a disaster. 5-4, Sharapova: That’ll help: Sharapova drives a FH DTL winner off a short Azarenka return. 15-0. SW, 30-0. Fantastic depth from Sharapova with her BH, and it’s 40-0. AND AN ACE SEALS IT! Clutch by Maria Sharapova. Game, Set and Match to Maria Sharapova, 6-1, 1-6, 6-4. This was quite the rollercoaster ride, eh? All I kept thinking as I tried to organize my thoughts about this match was about The Cure’s aptly titled “Wild Mood Swings” album. Now, I’m not sure the moods of both players swung so violently on Chatrier today: they were both extremely focused on the task at hand, trying to execute the right gameplan to the best of their abilities. But that execution…that sure had wild swings. Exhibit A: Maria Sharapova started the match in abysmal fashion, getting broken at love. What happens next? Exhibit B: The Russian proceeds to reel off 6 straight games, breaking Azarenka’s serve 3 times after having 0-40 edges in all three of those return games (Azarenka got one of those to deuce…and those were the only points she won on her own serve in the entire first set). Exhibit C: Maria Sharapova, after devouring Azarenka’s serve in thee first set, can’t create a single break point in the second. Which she dropped 6-2. Of course, the third set was different, because variety is always nice. It was nervy, and it included a few breaks of serve. Sharapova served for it at 5-2, and she had 4 match points before surrendering her serve via a double fault for the fourth time in the match (never a good thing). But this semifinal did eventually end with the most emphatic service game possible: a love hold capped by an ace on match point. Overall, the fate of this match seemed to hang on Sharapova’s racquet throughout. It was fairly obvious that when Maria got the depth she wanted out of her shots, Azarenka had no answer. I was fairly surprised to see Sharapova win so many CC BH duels: Azarenka has probably the third best BH in the world. What I did think was unfortunate for Azarenka is that she just couldn’t win enough CC FH rallies: that’s where she should’ve had an edge, given Sharapova’s historical problems off that wing. Still, Azarenka had a sound gameplan, and she tried her best to get Maria to move by going DTL with either her FH or her BH as soon as she could. The problem is that changing the direction of the ball off deep Sharapova missiles is quite hard. Which is the understatement of the year, probably. Today’s was a battle of depth of shot vs direction of shot, and depth won. Azarenka found it extremely difficult to get back in rallies (or indeed, stay in rallies) when Sharapova’s baseline rockets were coming close to the tape. It doesn’t help that Sharapova’s shots are flat as heck, so they stay low to the ground after the bounce. Someone like Azarenka, who will doggedly try to stay on the baseline, won’t often decide to step a few feet back to give herself some extra time. Those are core values that don’t get messed with during live matches. 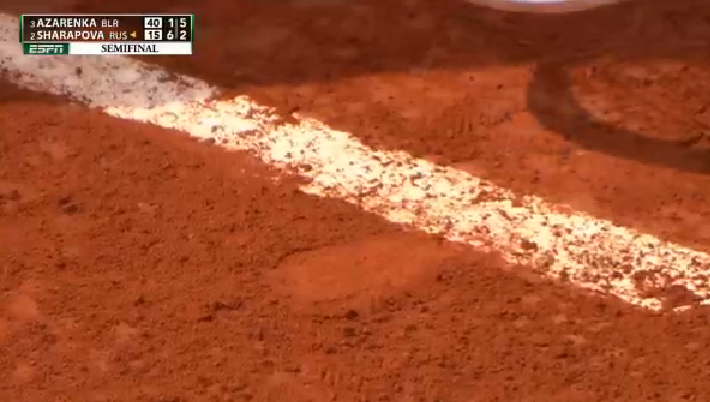 It also doesn’t help that, while Azarenka has had a fantastic clay court season, this is still her worst surface. Her movement is still uncertain at times and in matches like today’s, that comes at a cost. However, she’s young, and she’s improving dramatically. So it shouldn’t be surprising to see her make big clay finals (and maybe winning them) in the future. As for Maria Sharapova, the thrill of making the Roland Garros final for the second year in a row (this is the first time she’s been able to make the final of a Slam a year after winning it, per Lindsay’s research) has to be dampened somewhat after watching (or hearing about) Serena Williams’ absolute masterclass in the other semifinal. We all know the dynamic between Maria and the 15-time major champ: just a few weeks ago in Madrid I saw all I needed to see in terms of how this “rivalry” fares on clay. And what I saw was not good for Maria Sharapova. Still, the good news for the candy entrepreneur is that Serena Williams isn’t an enigma for her. It’s more about executing a known gameplan at an extremely high level for at least 2 sets. Sharapova just a few months played as well as she needed to in the Miami final. Her problem? It lasted until 4-3 in the second set. She didn’t win another game from that point on. But regardless of what happens on Saturday, Maria should look back at her incredible success in the past few years on this surface and see it as one of the greatest achievements of her life. And hey, if she does hit the mythical Zone for 2 sets…she might be taking home a second Rolly G title in the sweetest way possible. Previous Entry: Maria Kirilenko Is In the Top 10, Let’s Make Party!